The 'D' of DISC stands for Dominance, the factor of determination, ambition and motivation to succeed. 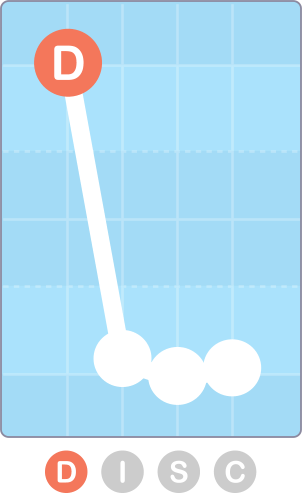 The level of Dominance in a personality is shown on the far left of a standard DISC graph. When a set of DISC results shows a high Dominance factor, they're describing someone with an independent attitude and a motivation to succeed on their own terms. High-D's (as we call people of this kind) have the strength of will to work well under pressure, and are always ready to take on responsibility. 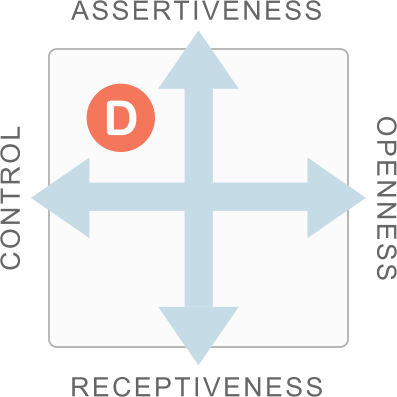 On a Style Card, Dominance appears where a person shows high Assertiveness, but low Openness (we call low Openness Control; it relates to people who tend to rely on their own resources rather than other people). Dominance lies in the top-left quadrant of the Style Card, where Assertiveness meets Control. That combination means that highly Dominant people have a clear idea of their ambitions and goals, as well as the directness and forcefulness to achieve those goals. It also means that people like this will tend to have a competitive attitude, and they will generally follow their own ideas rather than work co-operatively with others. What happens in the opposite case, where Dominance is low in a DISC profile? Perhaps the most noticeable feature of Low-D's is their lack of directness. They'll tend not to confront a difficult situation head-on, though they may find other effective ways of dealing with things (exactly how they'll do this depends on the other factors in their personality). They also tend to be much readier to work productively as part of a group than their more independent High-D colleagues. A High-D's sense of independence and personal responsibility means that they will tend to gravitate towards roles where they have the greatest possible scope for action. They'll also tend to avoid situations where they're reliant on other people for support, or subject to too much control. Dominance is often a useful trait in a manager or leader, especially in situations where there's a need for decisive action and clear direction. Note that this certainly doesn't mean that High-D's always make effective leaders - that depends to a huge degree on the situation - but the core features of this kind of personality tend to match well with the challenges of leadership. Another type of role classically associated with high Dominance is that of sales, especially direct sales. The factor gives a person the force of personality to make a strong pitch, and the resilience to close a sale in situations that other types would find highly disconcerting. This is especially true whether Dominance combines with high Influence, representing a person with a persuasive element as well as the determination of Dominance alone. How does Dominance affect the ways that a person will act and react in real-world situations? Here are a handful of examples to give you more of a flavour for the kinds of ways a High-D will usually react in some common situations. High-D's are commonly described as 'decisive', but this is meant in the sense that they'll prefer to make a rapid decision, and potentially take a risk, rather than take time to evaluate all the options or possible outcomes. At least, this is the typical approach of a 'pure' High-D, with no other strong factors. Additional factors can complicate the picture: a High-D who also shows high Compliance, for example, will tend to be more receptive to the details affecting a decision. High Dominance isn't associated with the organisation or the natural caution that go into detailed planning. As we saw in their approach to decision-making, a person like this will prefer to follow their instincts, and they'll often be ready to disregard a planned course of action if they see an alternative opportunity. High-D's tend to have uncompromising personalities, and aren't afraid to confront other people directly if they think a situation calls for it. So, it's not uncommon to find them involved in disputes with others, but resolving disputes like this can be difficult. A highly Dominant person will need to feel that they achieve some real advantage from any possible resolution. Self-reliance: High-D's rely on their own independent resources, rarely looking for help or support from those around them. Competitiveness: People like this are motivated by success, especially tangible success in competition with others. Ambition: Dominance relates to a clear set of goals or ultimate aims, and the determination to work towards those goals. Decisiveness: High-D's generally have little patience, and will prefer to make a rapid decision, even if that involves a degree of risk. Leadership: Their preference for independence and their forthright attitude means that people of this kind will tend to work towards leadership roles.